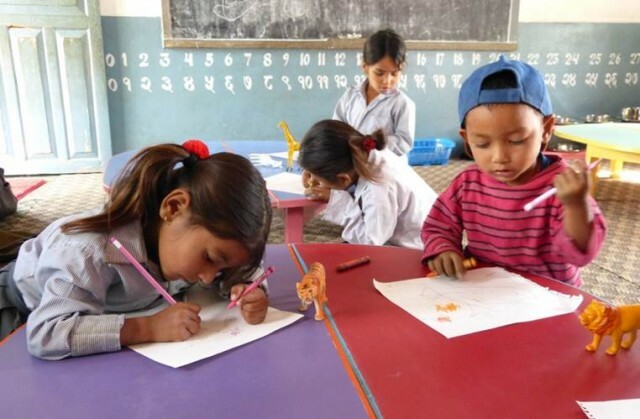 CAIRN (Child Aid In Rural Nepal) Trust is a children’s charity established to improve educational opportunity and widen access to education for children in Nepal. CAIRN’s mission is to develop sustainable rural communities through child education. The charity focuses on helping communities in rural Nepal, where over 23 million people live (84% of the Nepalese population) and education is still inaccessible for many. School provision, even where it exists, is often poor, with inadequate classrooms and untrained teachers offering rote learning not supported by learning resources. Schools frequently lack enough furniture and have poor sanitation. Based on the knowledge that early child development is key to fulfilling children’s potential and is the foundation for future learning and health and economic well being, CAIRN has developed a new early years delivery model for pre-primary and primary level education. BFSS is supporting a new CAIRN Early Years (CEY) project in Sikles District, Western Nepal. It is based on improving infrastructure by providing safe and learning friendly classrooms, a programme of on-going teacher training and development of appropriate and effective learning resources. The first year of the programme started by assessing teaching capabilities, school leadership, available resources and classroom setup, with baselines set for future progress monitoring. The needs assessment demonstrated that almost all teachers taught using rote and drilling methods and that, whilst teachers had theoretical knowledge, they lacked the practical skills to transfer this to the classrooms. As a result training workshops, clinics and a coaching programme for teachers have been initiated linked to key progress indicators and targets that will be monitored over 3 years. New interactive teaching methods have been introduced and more suitable learning resources developed with teachers beginning to produce materials using local resources. Classrooms have been refurbished with new furniture, colourful decoration and safe equipment. 169 children are benefiting to date. CAIRN are confident that the resulting increased pupil development and progress, establishment of continuing teacher professional development and a culture of parental and stakeholder engagement are providing a firm foundation for future achievement and educational advancement for more children.